I recently purchased this LEGO Classic Large Creative Brick Box for my daughter, and while I spend most of my day silently cursing to myself when I step on pieces of it, I have to admit I really like making different creations with her. I didn’t enjoy our DUPLO days quite as much as I found the pieces were too big and the only things I could make were houses and condo towers, but the classic set has opened up an entire world of possibilities for me. Of course, my daughter doesn’t really have the attention span to sit and watch me fumble my way as I try to replicate all of the cool things she sees on YouTube, so I recently took to Pinterest to find some LEGO activities the 2 of us can do together. There are so many fabulous ideas out there, and this collection of activities make the perfect boredom busters. And if you’re looking for MORE ways to have fun with your kids, I recently stumbled across 3 fabulous kids activities books I think you’re going to love as they are FILLED with great ideas: 101 Kids Activities That Are the Bestest, Funnest Ever! by Holly Homer and Rachel Miller, The 101 Coolest Simple Science Experiments by Holly Homer, Rachel Miller, and Jamie Harrington, and 150+ Screen-Free Activities for Kids by Asia Citro. Who says bad weather days inside have to be boring?! This is a GREAT sensory activity for young kids, and all you need to make the slime recipe is some Clear Elmer’s Glue and Sta-Flo Liquid Starch! It’s amazing how a piece of string or parachute cord can turn a basic LEGO set into hours of fun for your kids! This is by far one of my favorite activities on this list. All you need is a large LEGO baseplate and some marbles, and Octavia and Vicky will teach you how to make a marble maze the whole family will enjoy. Can your kids build a bridge strong enough to support 100 pennies in a cup?! Frugal Fun for Boys and Girls has so many ideas on how you can build bridges and teach kids about distance, weight, etc. These candy dispensers make for a unique, fun gift kids can make for teachers and grandparents! Why not add a little learning to your afternoon activities with these free ABC LEGO printables?! This is a fabulous travel activity for kids. 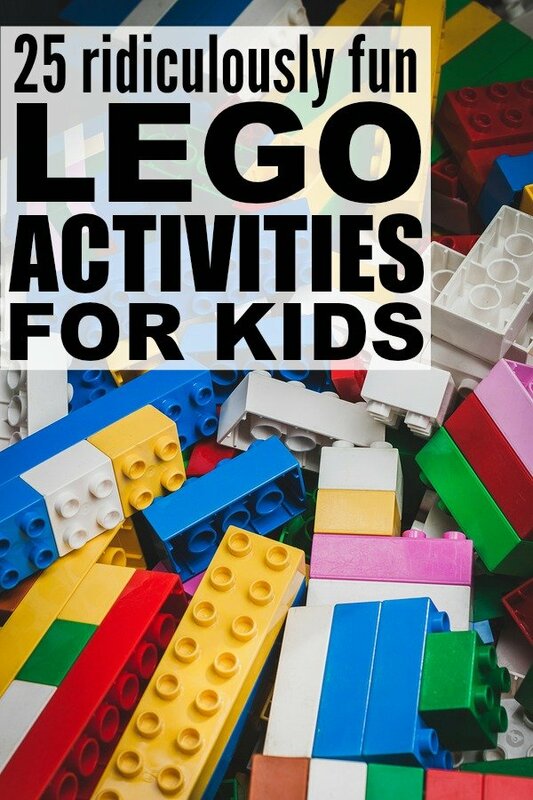 All you need is LEGO and a small plastic box, and Fun at Home with Kids has 24 activity cards you can download for free! Everyone loves playing BINGO, and this activity is perfect for school classroom parties, family game nights, and playdates. Big D & Me even provides a free printable so you don’t have to prep anything in advance! If you have some brown lunch bags and construction paper lying around, this activity is great for toddlers and preschoolers! Yup. This is pretty brilliant! The LEGO Classic Large Creative Brick Box has all the pieces you need to replicate this awesome activity, but you’ll also need some scrapbook letters. What a great activity to get kids excited about counting and math! If you want an excuse to buy a LEGO Education Wheels set, this activity will give you exactly that! 13. Lego Science Scavenger Hunt | Fun-A-Day! This is the PERFECT bad weather activity for little kids! Not only is it a fun way to develop your child’s fine motor skills, but it also teaches things like visual discrimination and chemical changes. Another fun math-based activity that also teaches kids about sequencing and assembly. Take your at-home math lessons a step further with this LEGO DUPLO activity that helps get kids excited about measurement! Wow. This is a REALLY fun activity to do with older kids, and Frugal Fun for Boys and Girls will teach you how to do it, and which supplies you need! 17. Lego Star Wars Molten Lava Slime for Kids | Fun-A-Day! Grab your child’s favorite LEGO characters and provide them hours of fun with this molten lava slime activity! LEGO DUPLO offers so many ways to teach kids about their letters and numbers, and this sight word activity will give you more inspiration to keep your little ones learning! I know I already included a marble run at the beginning of this list, but this one is slightly different and perfect for older kids. You have to check it out! A slightly simpler balloon-powered car your younger kids will love! 21. Star Wars Lego Science – Save Han Solo! | Fun-A-Day! Another science-based scavenger hunt, but this time with Star Wars! Grab the washable paints and let your kids express their artistic talent with LEGO! Got a child who is obsessed with Despicable Me? This minion LEGO activity will NOT disappoint! This is an awesome way to teach kids about counting syllables! Who knew you could power a LEGO car with a rubber band?! If you enjoyed the LEGO activities as much as we have, please share them on Pinterest! And if you’re looking for more ways to have fun with your little ones, please follow our Kids board where we share all kinds of fabulous activities and crafts!